Bill Jordan once said that the handgun was the symbol of the policeman's trade. What, though, are the common police sidearms? 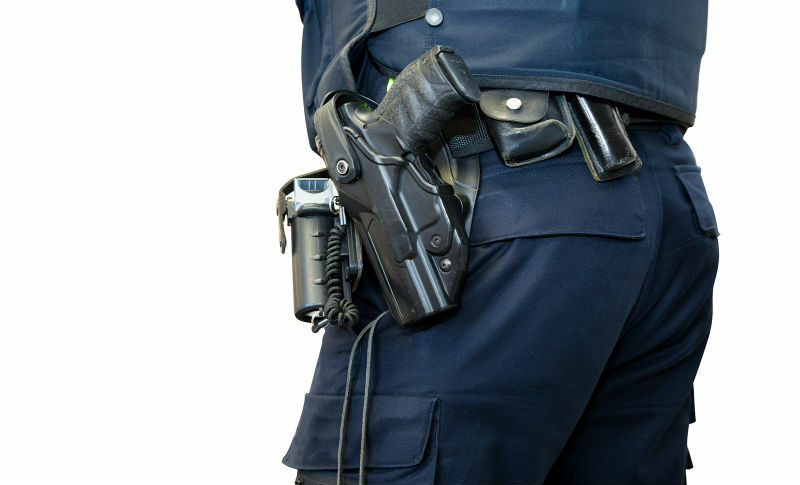 Among police pistols, consensus is that police sidearms are almost always from one of four brands: Glock, Sig Sauer, Smith and Wesson or Beretta. We'll show you which models, as well as some blasts from the past which we'll also get into. 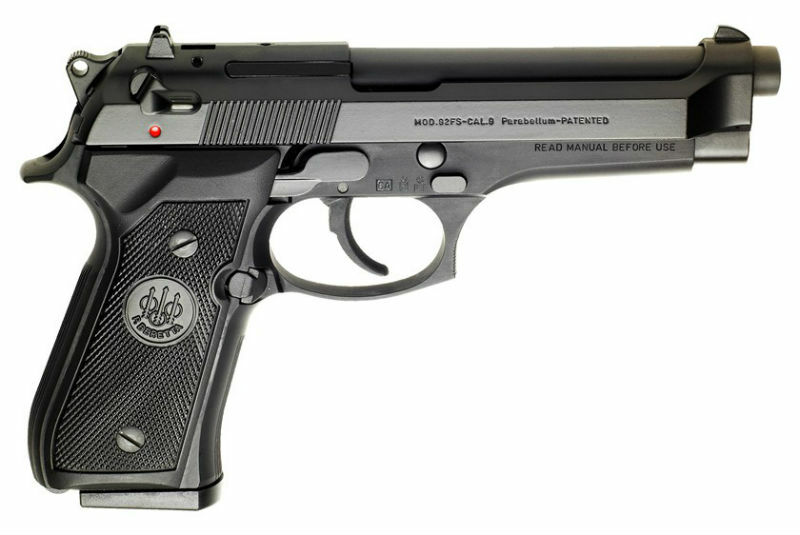 First up is the Beretta 92, which also happens to be the outgoing duty handgun of the US military. Plastic fantastic fans can say what they will; the 92 is one of the all-time great service pistols and that is exactly why many law enforcement agencies have opted to issue it for decades. It holds 15+1 of 9x19mm and comes in DA/SA configuration with a decocking safety. Variants can be ordered in DAO and decocker only; which is issued depends on the department. They also come with accessory rails nowadays for use with a light. While the Beretta 92 is a brick, for sure (it's enormous) it's also a workhorse provided decent care. The Glock 17 is nearly everything that could be desired in a working handgun. They stand up well to abuse, they're accurate and incredibly reliable, there's a rail for a light, parts are cheap and they hold 17+1 of 9x19mm. They're so easy to learn how to use that even a caveman could do it virtually anyone could learn the manual of arms in a few minutes. They're also easily acquired, as they're in pretty much every gun store and are also very affordable. The same also goes for the Glock 22, which is the same gun but chambered for .40 S&W. Another of the most common police guns is the Sig Sauer P226, another steel-framed double-action throwback to the time when men were men and so were the women. 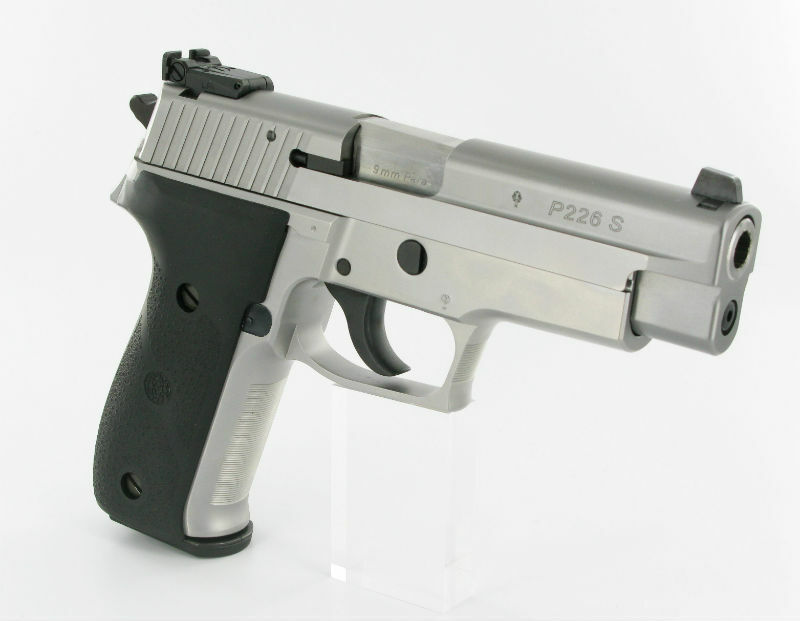 The P226 was unleashed in the 1980s as a service pistol and quickly gained a reputation for iron-clad reliability and accurate shooting. However, what sets Sigs apart from others is the operating mechanism, as Sigs only come with a decocker, allowing the user to get the gun into the fight at a moment's notice (or less) without needing to muss with a safety. 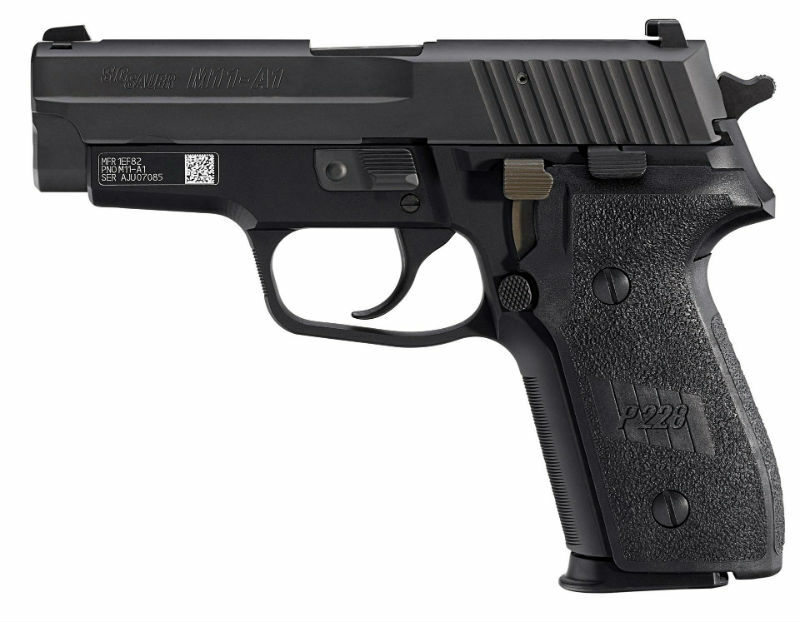 Some departments require them to be DAO but in any configuration, the P226 is about as solid as a duty gun gets. However, you'll pay the Sig premium and you will need one heck of a gun belt to carry the beast, but you'll know where the money went when it's still shooting decades after you buy one. 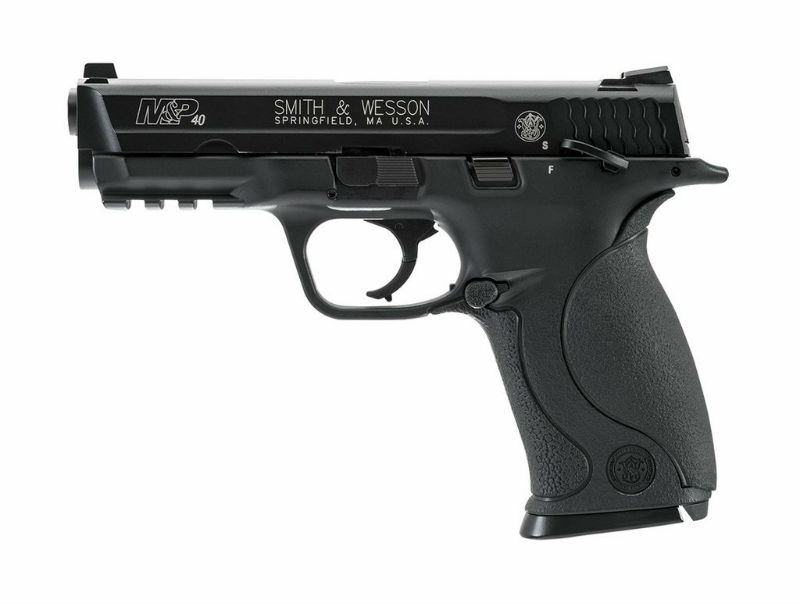 The Smith and Wesson M&P line is S&W's current poly-striker gun family, and two of the full-size guns - the M&P9 and M&P40 - are standard issue in many departments and for good reasons. Capacity is appreciable - 17+1 of 9x19mm or 14+1 of .40 S&W - and the manual of arms is similar to Glocks, which many people are familiar with. However, the S&Ws can be had with ambi manual safeties if desired. A lot of people find them ergonomically superior to Glocks, though that is totally subjective, and they can be obtained in many cases for less in sticker than Austria's most famous export since Arnold Schwarzenegger. 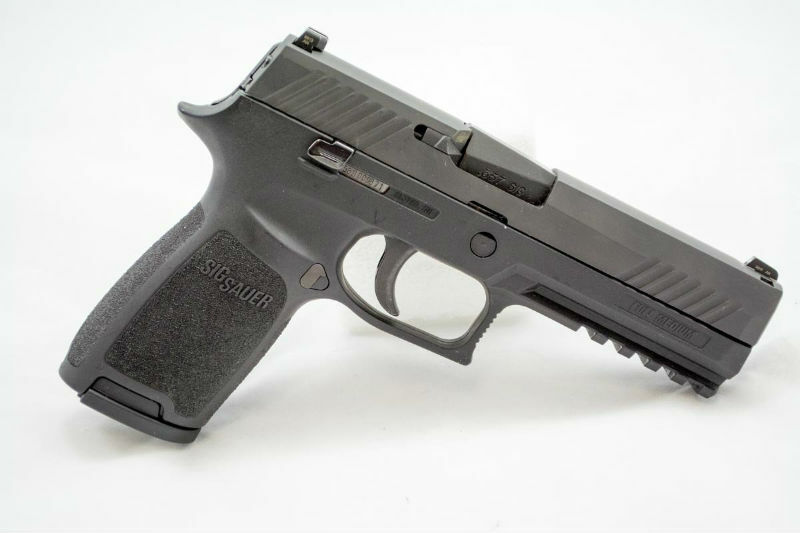 A number of police departments adopted the Sig Sauer P320 as a police gun - though a few have backtracked due to that whole drop fire thing of late - and many more are considering it after the P320's mil-spec variant was announced as the new handgun of the US military. The P320's modular design - the trigger group can be dropped in different sizes of frame, which can be fitted with different sizes and configurations of slide assemblies - means it can be used as a duty gun or concealed carry pistol. The P320 formerly could be had with or without a tabbed trigger (the non-tabbed trigger was the trigger group involved in the drop-fire dilemma) the full-size model is a beast of a service pistol. It holds 17+1 of 9x19mm, 14+1 of .40 S&W or 10+1 of .45 ACP, with an accessory rail and night sights. It also has an MSRP that's reasonable - rare for a Sig! It isn't Sig's first foray into poly-frame striker guns, but a lot of people feel it's their best. Well...until the whole drop-fire thing happened. They're fixing it though. 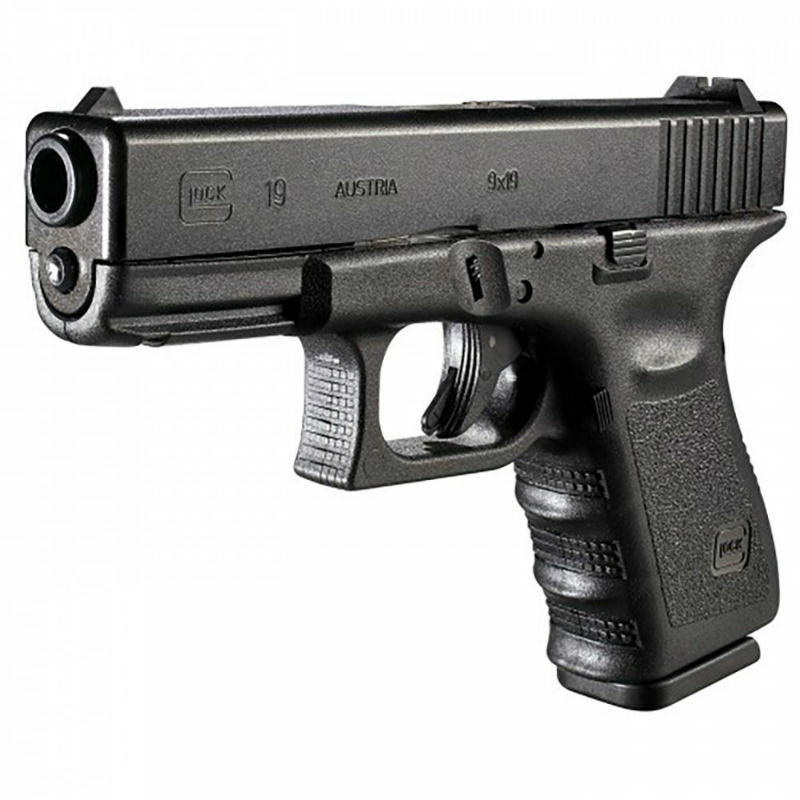 The Glock 19 is an excellent choice in duty gun if one desires a more easily concealed pistol or if one finds the Glock 17 a bit too large, which some people do. In that case, the Glock 19 is a perfect fit. A lot of people consider it a Goldilocks gun, which it almost definitely is. Just big enough to be used as a duty gun, just small enough for concealed carry, which has also made it a hit with civilians. 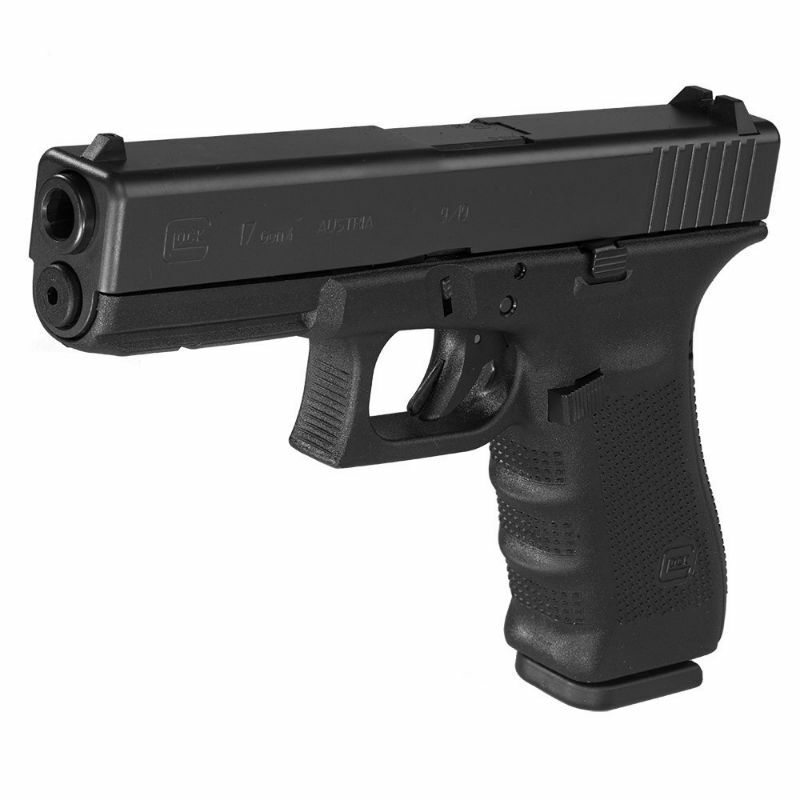 It carries 15+1 of 9mm, though the also-popular variant in .40 S&W - the Glock 23 - is also popular for the same reason. The Sig P229 isn't the most common police gun, as it's a compact, though that attribute has made it popular with plainclothes officers and as an off-duty gun. Granted, the term "compact" is a tad subjective; the P229 is only half an inch shorter in length than the P226 (the P229 has a 3.9-inch barrel vs 4.4 inches in the P226) which is enormous. Other than that, it's the same gun - same capacity, same width, even the same weight. (In fairness, the P229 is 0.1 inch shorter in height...so it's got that going for it, which is nice.) Just like the P226, prepare yourself for the Sig premium (MSRP is almost $1100) and you're going to need a good gun belt. Though they may not be issued anymore, there are some police guns of bygone eras that are still available today! Some are revolvers, some are former police guns that are still being made. Some you'll have to hit the used market for, but it may be worth it. Snubbie revolvers were popular as backup guns and for off-duty concealed carry. S&W still makes the J-frame, and Colt recently started making the Cobra again, which was popular in its day. Older Colt Detective Specials can also be obtained for pretty reasonable amounts and provided good care by previous owners are still good snubbies for CCW. Service revolvers are something else. One of the most popular is still in production, the Smith and Wesson Model 10. It's a 4-in .38 Special K-frame, a tad big for concealment but a very good choice of nightstand gun and in practiced hands, devastating. Colt's service revolvers are long since out of production, but you might be able to find the odd Colt New Service or Police Positive for a reasonable amount. You will NOT find a Python for a reasonable amount, so unless you have more money than Croesus, forget it. That said, the Colt Lawman and Colt Trooper revolvers (budget Pythons for the law enforcement market; same frame size as the Python, but without the iconic full underlug) can be had for amounts that aren't stupid. Ruger's Service Six, Speed Six and Security Six revolvers can be reasonably obtained, and were widely considered better than both S&W and Colt revolvers by those that carried them. Unlike S&W (can't handle too much Magnum ammo) and Colt (timing goes out!) revolvers, these guns will digest anything you feed 'em and will probably get willed to your grandchildren because Ruger. Some older Smith and Wessons that were popular as police guns included the Triple Lock and Hand Ejector N-frames in .44 Special, the Registered Magnum N-frame in .357 Magnum, and the Model 19, a.k.a the Combat Magnum, an L-frame in .357 Magnum designed at the behest of Bill Jordan as the N-frame is just too bulky. If you can't find them used, they can be had new though under new names. The DNA of the Hand Ejector models went into the venerable Model 29 in .44 Magnum (it'll shoot .44 Special all day) and the Registered Magnum was (more or less) re-christened the Model 27. The Model 19 got dressed down a bit with a stainless steel frame and rubber grips, and was re-named the Model 66. You'll spend for all three, but you get quality. Smith and Wesson autos, such as Models 5906, 4006, 59 and 39 - to name a few - were also popular police guns, and can easily be found on the used market. They're double-stack DA/SA autos with steel frames, and were among the most popular of the first wave of police semi-autos before poly striker guns came in and made mediocrity acceptable. They're easy to find, easy to buy. Many police officers also carried 1911 pistols and Browning Hi Powers as auxiliary weapons, when deparment policy allowed officers to use a different gun. Plenty of both are still made today, though the BHP will set you back a bit. There are others, of course, but those are some of the most popular police guns from back in the day.